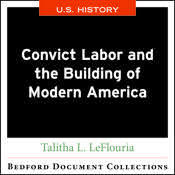 Convict Labor and the Building of Modern America-U.S. Through an analysis of the sources in this document collection, students will gain a better understanding of how convict labor was used during the second industrial revolution. By examining the documents, students will develop critical analytical skills and the ability to interpret historical evidence from a variety of sources: textual, audio, and visual. Students are guided through their analysis of the primary sources with an author-provided learning objective, central question, and historical context.